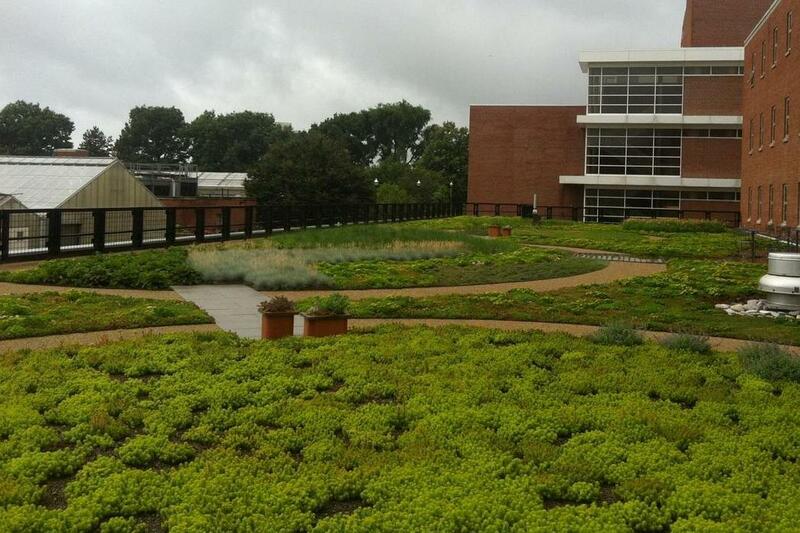 In August and early September of 2013, the Green Roof on Howlett Hall was installed in the Chadwick Arboretum & Learning Gardens – the first retrofit green roof at The Ohio State University. 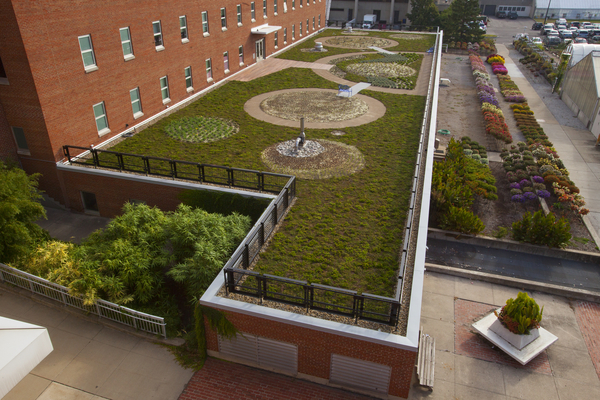 This 12,000 square foot green roof is located on Howlett Hall, home to the OSU Department of Horticulture & Crop Science, Department of Food Science and Technology, and the Chadwick Arboretum & Learning Gardens Headquarters. 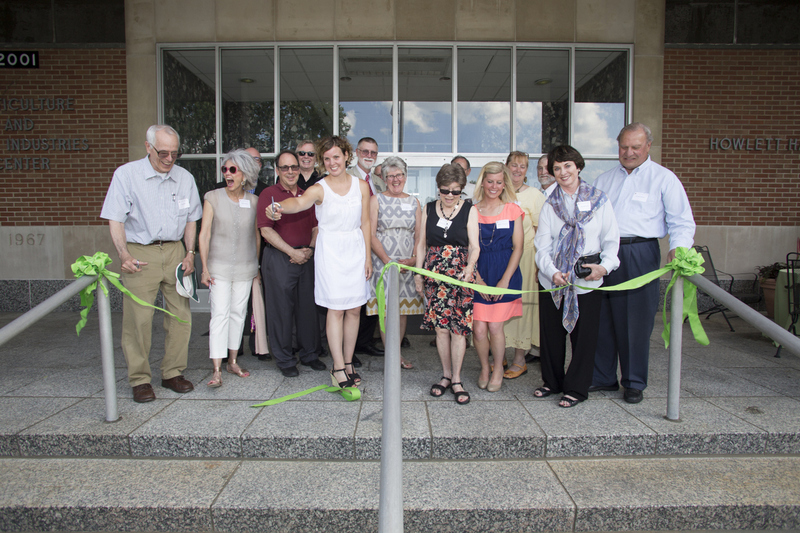 This site is an ideal location with high visibility, handicap access, and easy walk-out access from the main entrance of the building, allowing it to be a demonstration for future green roofs not only in Columbus, Ohio but in the world. 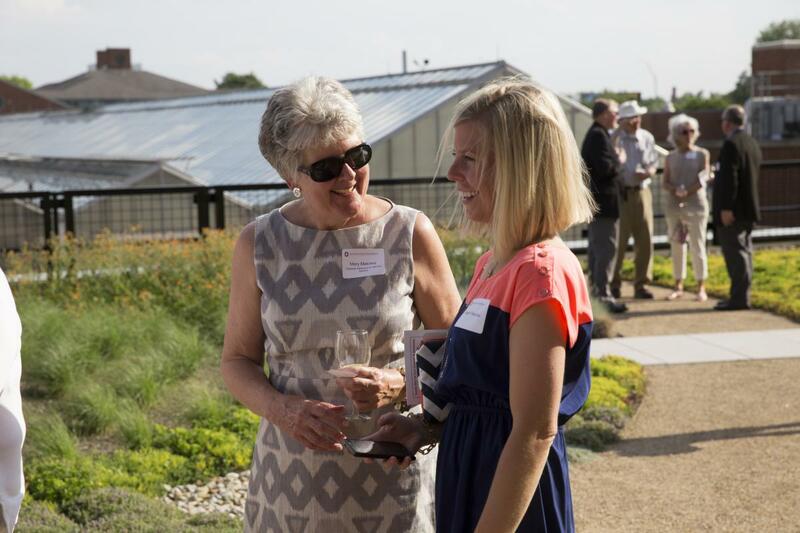 Stop by and enjoy a beautiful garden where an industrial, barren, asphalt roof once stood. Click on the image below to see our Green Roof installation as a time-lapse video. 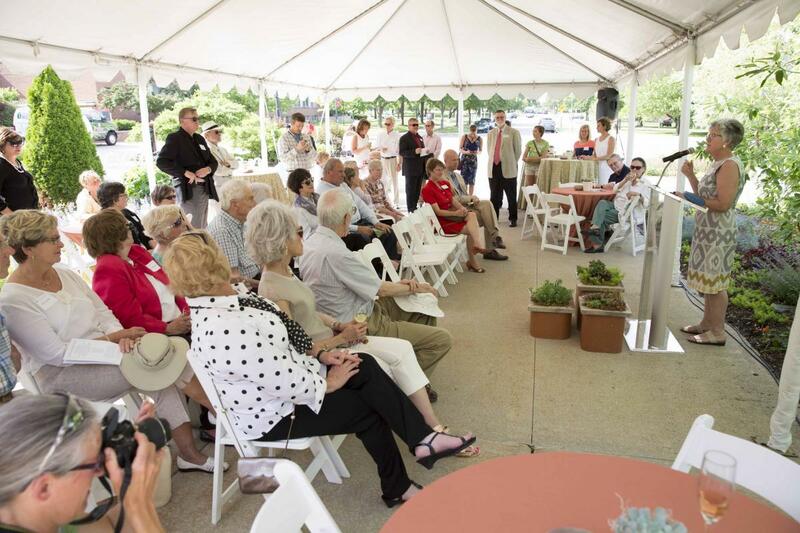 After years of planning, design, and fund raising the actual installation – from the water proof membrane to beautiful plants – was completed in 14 days. Simply put, a green roof is a living, breathing vegetated cover over a built structure. 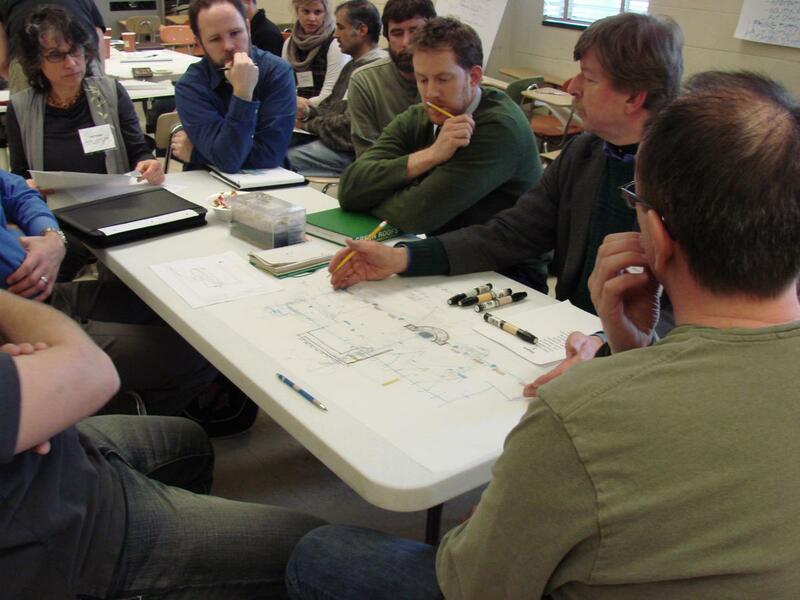 There are two main classifications when discussing green roofs: extensive and intensive. The differentiation is primarily in the depth of the growing media. Extensive green roofs are lighter weight and typically less expensive, but have limitations in planting design. Intensive green roofs are heavier and therefore suitable for structures with a strong load bearing capacity. The depth of growing media on an intensive green roof ranges from 6–18 inches and therefore offers a broader palette for design and plant selection, but it costs more than an extensive roof. 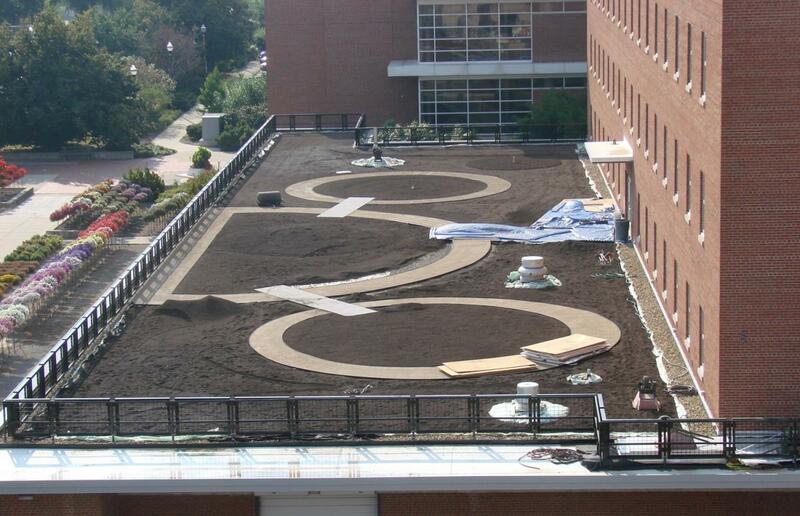 "Ohio State rooftop garden finally growing" was published in The Columbus Dispatch in October, 2013 after installation and planting. In urban developments like The Ohio State University campus, sewage flows naturally to publicly owned treatment works (POTW) during dry weather, where harmful pollutants are removed before returning water to the environment. During wet weather, however, rainwater does not percolate back into the ground as it was intended to do. Instead, it falls on paved surfaces such as roads, parking lots, and buildings, collecting debris and pollutants on its way to the nearest sewer opening. At OSU, this polluted water combines underground with our wastewater system and, in the event of a heavy rain, overflows directly into our local Olentangy River through combined sewer outlets (CSOs). With an average annual rainfall of 37 inches, the Green Roof on Howlett Hall would mitigate a minimum 22.8 inches (60% mitigation) compared to the surrounding parking lots. 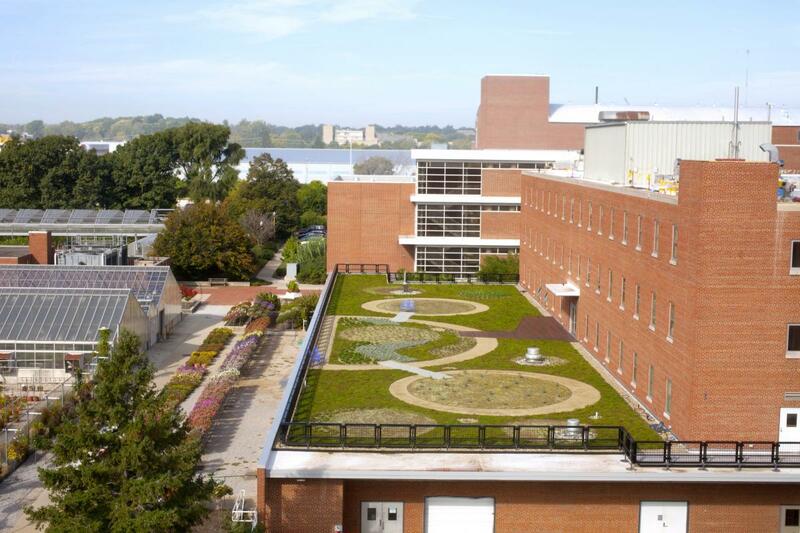 The green roof coverage of 12,000 square feet will reduce the impact to the Olentangy River by approximately 976,000 liters (approximately 250,000 gallons) of water each year. 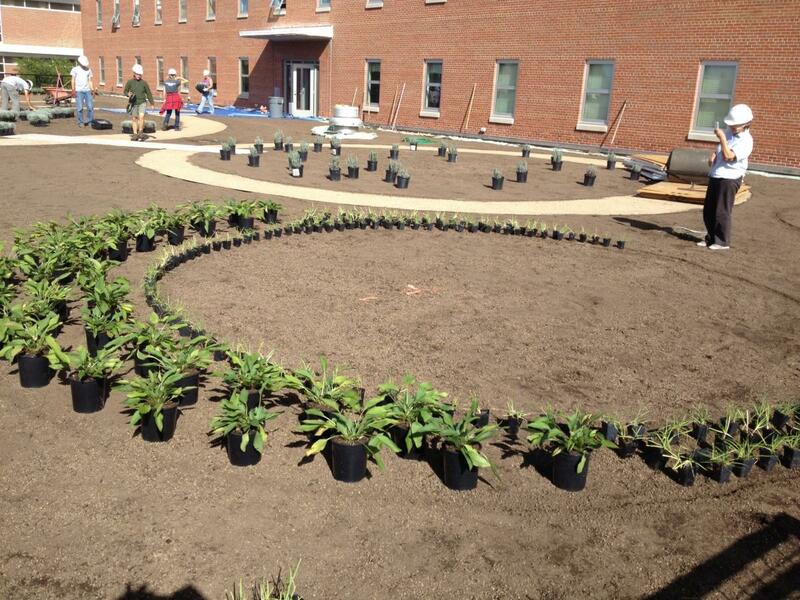 To support the momentum of the Ohio State sustainability efforts, the Chadwick Arboretum & Learning Gardens mission was to develop a prototype green roof that is visible and accessible to students, faculty, staff, and visitors. 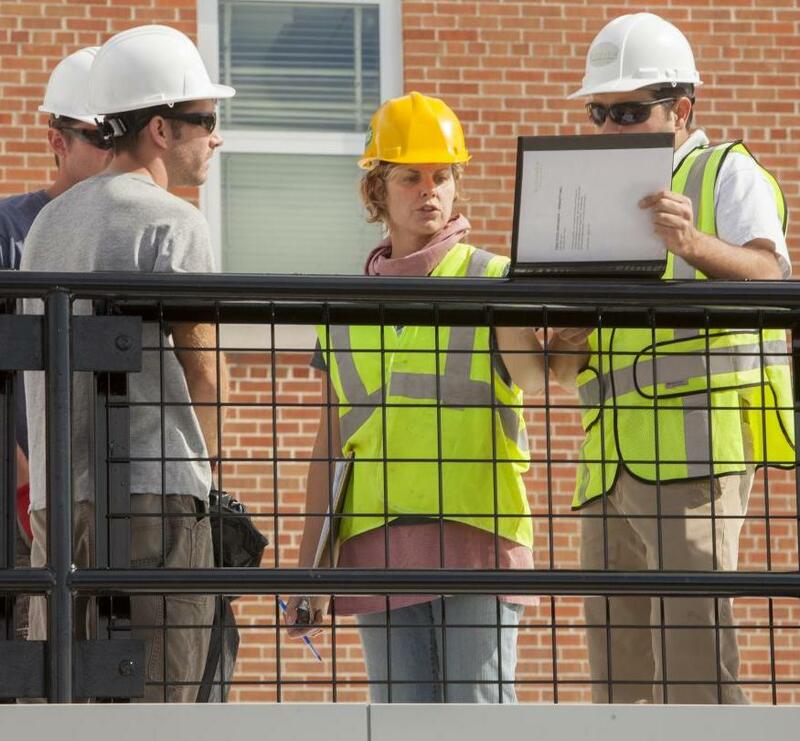 Although each green roof project is unique based on its exposure to climate elements (sun, wind, and rainfall), the purpose of this project was to document and streamline the best practices for green roof installation as a template to be used for future green roof installations campus-wide, supporting the overall campus-wide goal of 20% energy reduction by 2014. Further, as municipalities are required to comply with the Clean Waters Act, action must be taken to reduce the volume of contaminated water discharged into receiving waters. One approach is to integrate green infrastructure – such as a green roof – to mitigate storm water and slow its impact on the combined sewer outlets (CSOs). With the variety of bloom available on the Green Roof on Howlett Hall, it provides the perfect location for bees. 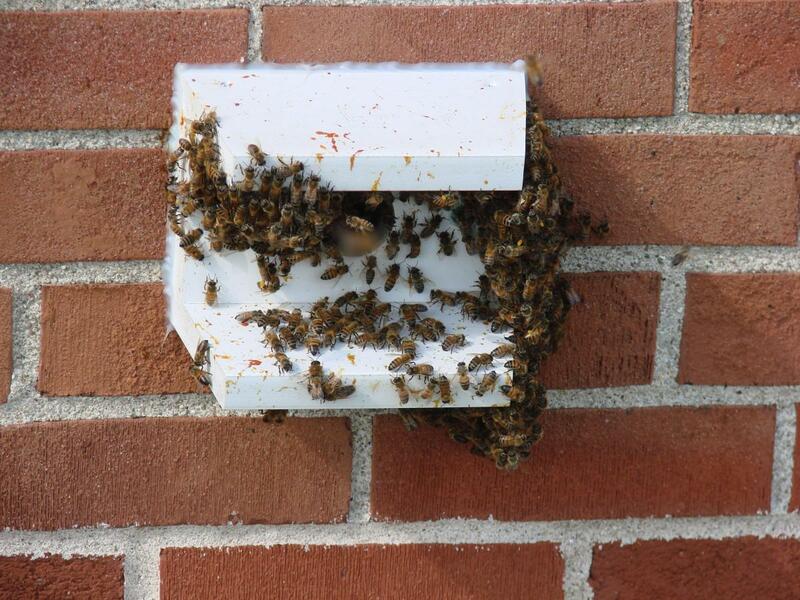 Our bees maintain a live observation hive inside the building and enter through a portal tube. They can travel in and out unobstructed. The hive activity and the honeycomb can be viewed in the Entomology Lab in Howlett Hall, Room 115. 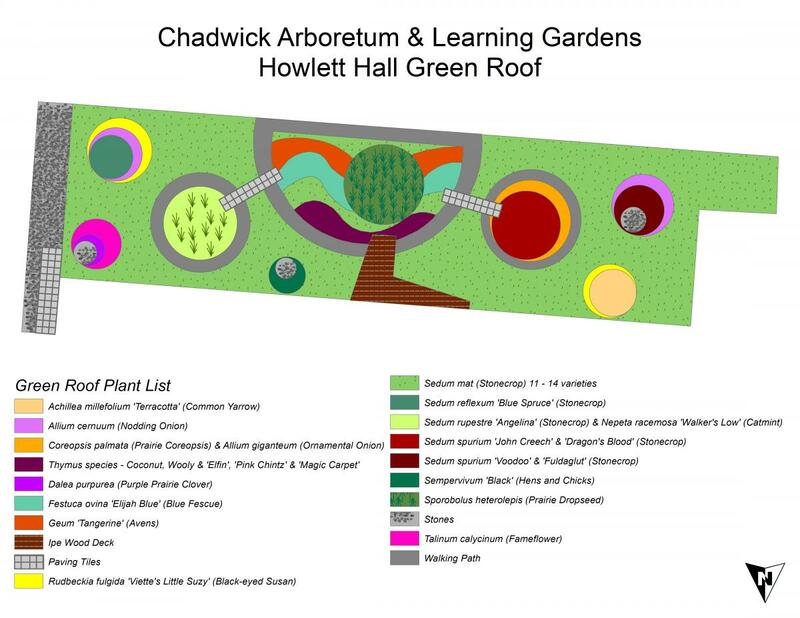 2007–2008: Research for a green roof at Howlett Hall is compiled. Green roof data is presented by student Megan (Ehrmin) Fleischer and Landscape Designer Professor Laura Burchfield at the Denman Undergraduate Research Forum. What is the best planting material for the Ohio Climate? 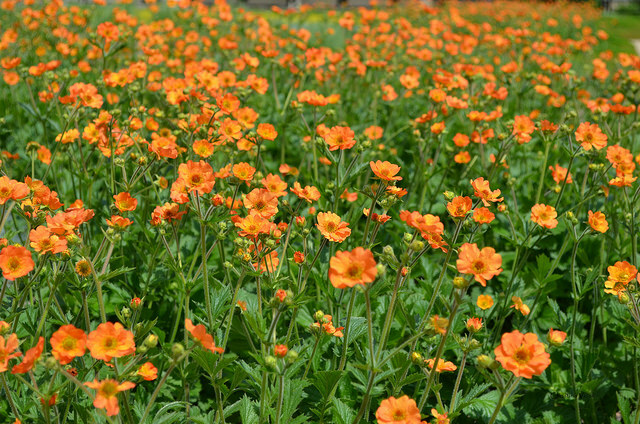 Depending on the owner's main objectives, there are plants to choose for higher transpiration/air cooling rates, or there are specific plants to choose if color and aesthetics are the objective. 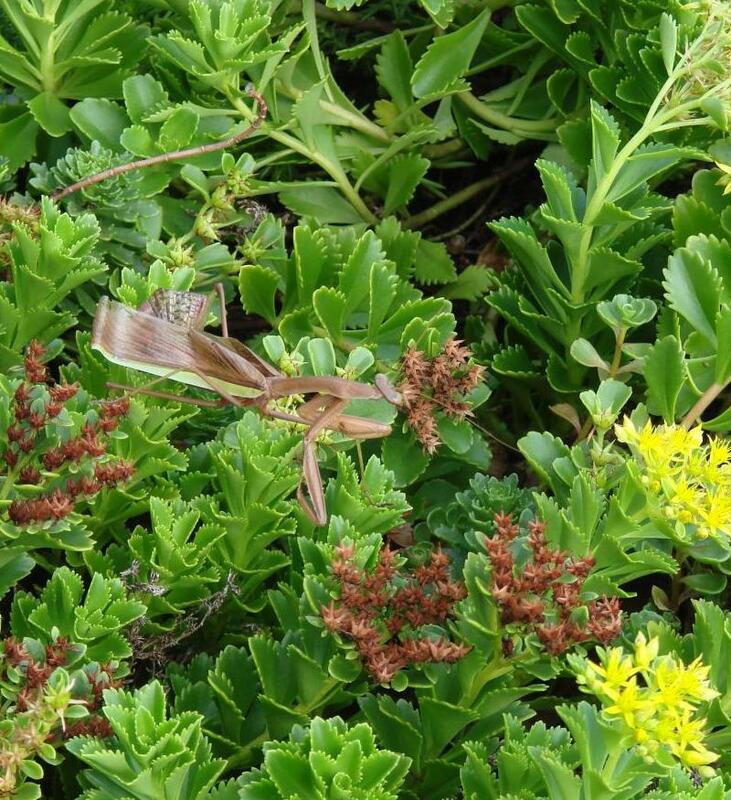 Sedums, like stonecrop, are typically used because of their drought tolerance and transpiration rate. 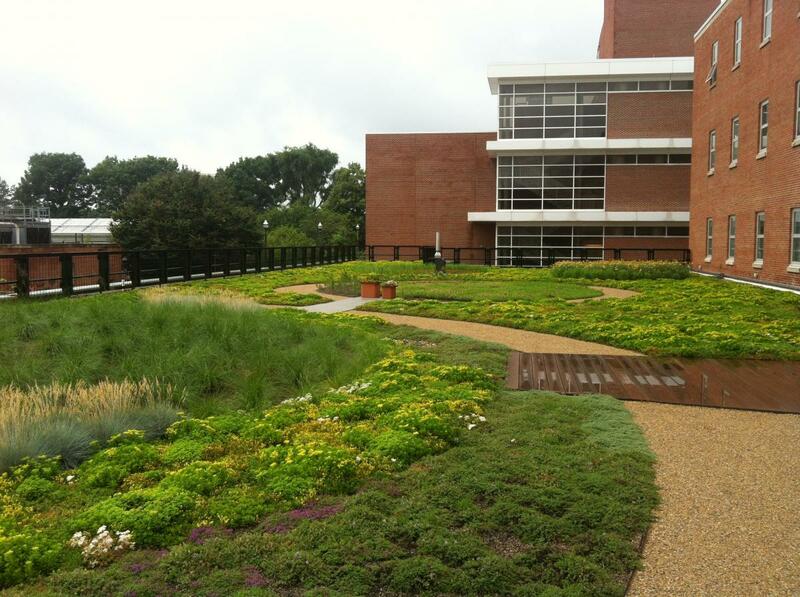 Other local green roof sites are using herbs and native perennials like Tickseed, Dianthus, and Catmint. What happens to the planting material in Ohio's cold months, and how does that effect the building's internal temperature? The plants go dormant in the winter, therefore the green roof goes dormant. It still functions in terms of added insulation and roof membrane protection from harsh winter elements. However due to low transpiration rates in the winter, it is not as effective in terms of stormwater mitigation. How many plants are on the roof garden?